With a baby on the way and a new house to decorate.... my mind is reeling with baby nursery possibilities!! The walls in the room our nursery will go in were already a soft aqua when we moved in, so I'd love to make it more modern and less baby-boy-ish by adding black and white furnishings and artwork with pops of colour. And with as much repurposable art as possible... not stuff that's so baby-centric that even the kid will want to get rid of it in three years. The trouble? I have expensive taste. Luckily, I'm not the only one! There are some pretty decent knock-offs of the furniture I fell in love with. I think I'm okay with liking popular things, if it means a price cut!! Here are a few of my ideas, and where to save money. The best part? All stores are easy to shop from Canada, even if you choose the pricier route. 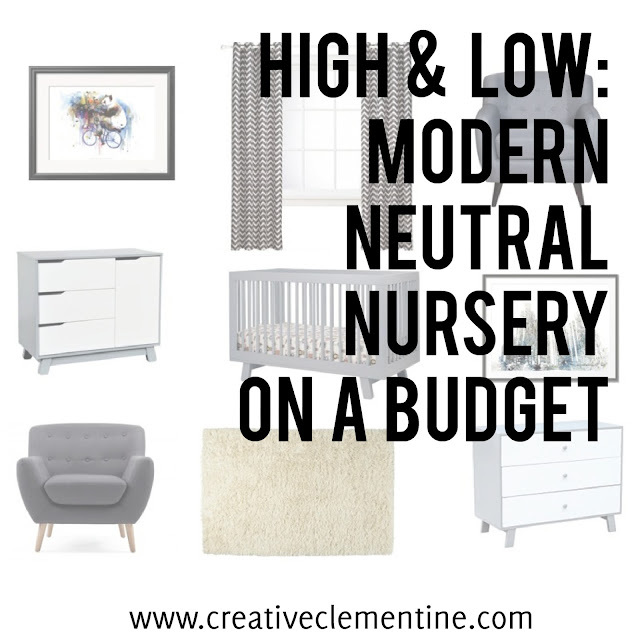 I didn't even know I had a particular taste in crib until I fell in love with multiple nurseries that featured the Baby Letto Hudson crib. And in grey? Talk about pulling my heartstrings! Can we just reflect for a moment on how those cribs are sooo close?! Also, can we just discuss the fact that I already ordered the crib and dresser, because Babies 'r' Us had an online sale? YES! I am so excited that we got the lower price crib for an even lower price that what I'm showing you. Now to spot out sales and coupon codes on all the other goodies! #RealTalk: the scoop on #clemsbigmove!